But now due to popular demand, Blindspott are hitting the road for a string of shows. Presented by Storm The Gates, they will play Logan Campbell in Auckland on December 8; The Foundry in Christchurch on December 14; Coroglen Tavern near Whitianga on December 26; Trafalgar Centre in Nelson on December 27; and Mount Park at The Mount on December 30. Their first two albums - 2003’s self-titled BLINDSPOTT and 2006’s END THE SILENCE topped the charts and established the band as one of the most respected and revered rock bands in Kiwi music history. Their hits, such as ‘Nil By Mouth’, ‘Room To Breathe’, ‘Phlex’ are still blasted on rock radio to this day, with this year’s The Rock 1500 boasting no less than 9 songs from Blindspott. 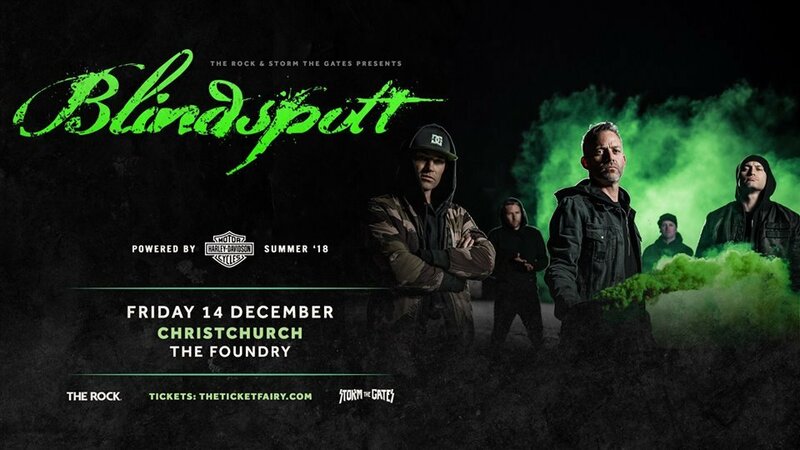 With both Blindspott sporting some of the most dedicated fans in the game; and with both bands renowned for putting on a show like no other, this travelling tour is one of summer’s absolute bucket list ‘must dos’.